Okay, this was a bad idea I had. It came out okay. I'm going to tell you how to make it. 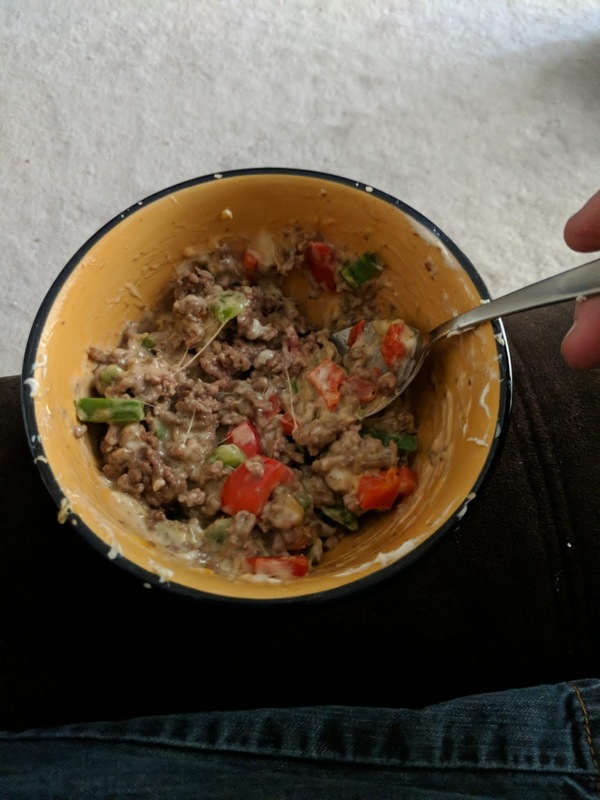 I ate it with a spoon, but if you're not doing keto you could do chips and control your portion that way. I don't have nutrition information figured out, but this thing is full of fat. Your choice of shredded cheese. I used Mexican, cheddar, and mozzarella. Get creative with it. Salt, black pepper, garlic powder. Whatever, you know how to season beef. Heat up a pan lubed up with olive oil. Drain the beef after it's most of the way browned. Season the beef. Mix in the peppers. Return to the stove and mix it around a bit. Get the bell peppers slightly less tender than you would normally. Throw your cream cheese into a bowl. Toss it into the microwave for 30 seconds. Nuke the cheese another 30 seconds. It should be a stringy goop when it's done. Mix a few lumps of beef/peppers into your cheese goop. Stir until it looks something like to picture. Microwave more if you have to. Shovel it into your face. You'll be full for a while. It might be your only meal for the day.